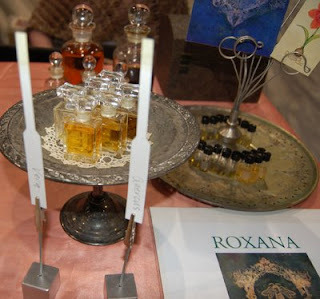 Roxana Illuminated Perfume: Pictures, Perfumes & Acoustics, Oh My! Pictures, Perfumes & Acoustics, Oh My! Sunday there is an opening for Greg's art works at our local organic cafe. Along with the display of fantastical visions I will be there with botanical perfumes and “The Season of Us” will be adding their melodies to the sensorium. Master Chef Giuseppe will be delighting our taste buds with his organic delectable culinary offerings. The event begins at 2pm, Greg has promised the first ten attendees a free “Musing the Goddess” card set. The creatrix of Heartworks by Lori will also be there showcasing the necklaces and pendants featuring our artwork. Cafe Carolina is located at 17934 Ventura Boulevard in Encino -- between White Oak and Lindley. For more information click here or call them at 818.881.8600. Three inspired hours of artistry, friends and merriment. We look forward to seeing you! 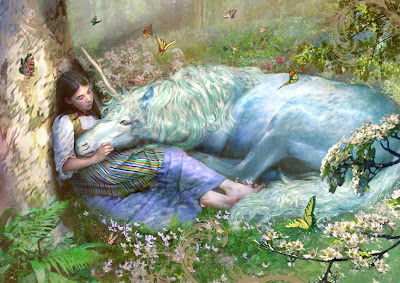 Image at top "Bliss" ©Greg Spalenka, one of the many giclee prints at the exhibit.